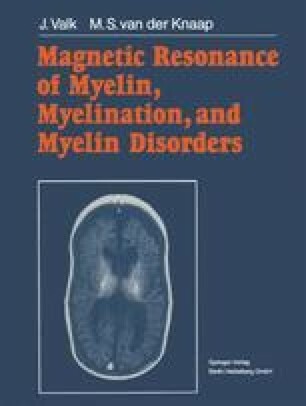 It is not the purpose of this book to discuss in detail the physical principles of magnetic resonance imaging (MRI) (see Valk et al. 1985). We will limit the discussion to what is necessary to understand the different sequences used in the illustrations, being respectively so-called T1-weighted (Ti W) images made with inversion recovery (IR) pulse sequences, or spin echo (SE) pulse sequences with short repetition time (TR) and echo time (TE), and T2-weighted (T2W) images made with SE sequences with long TR and long TE, often with simultaneous acquisition of multiple echoes (ME).